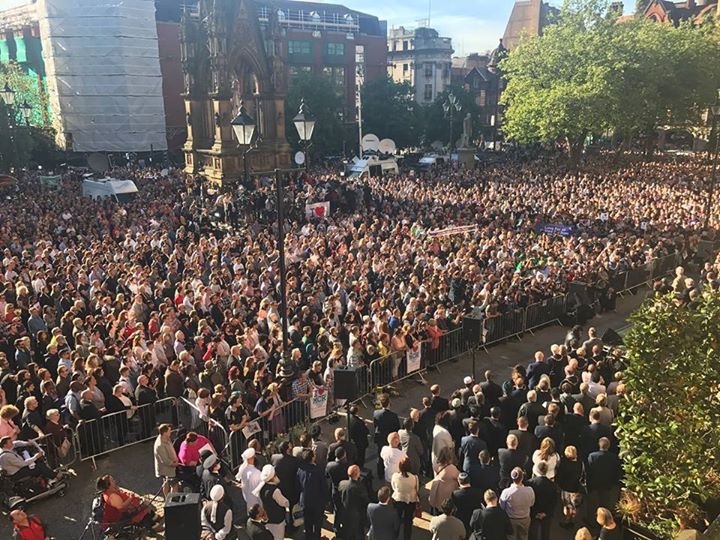 Most of us spent any spare time we had on Monday thinking about the families who lost loved ones in the appalling attack on the Manchester Arena. And about the consequences of it on our society. 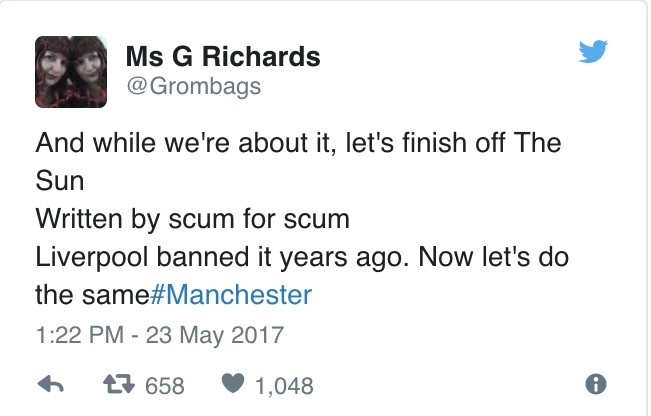 We watched as the people of Manchester pulled together in the face of adversity. But amongst the outpouring of humanity, we saw toxic elements surface. 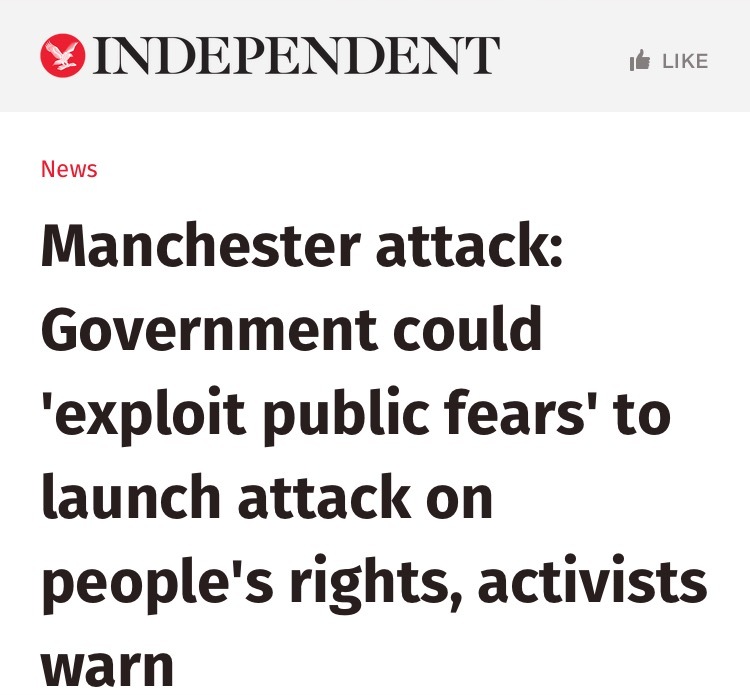 We saw people use the attack as an excuse to push their poisonous agendas. And we must also confront what it means for our democracy and for how we might move forward. 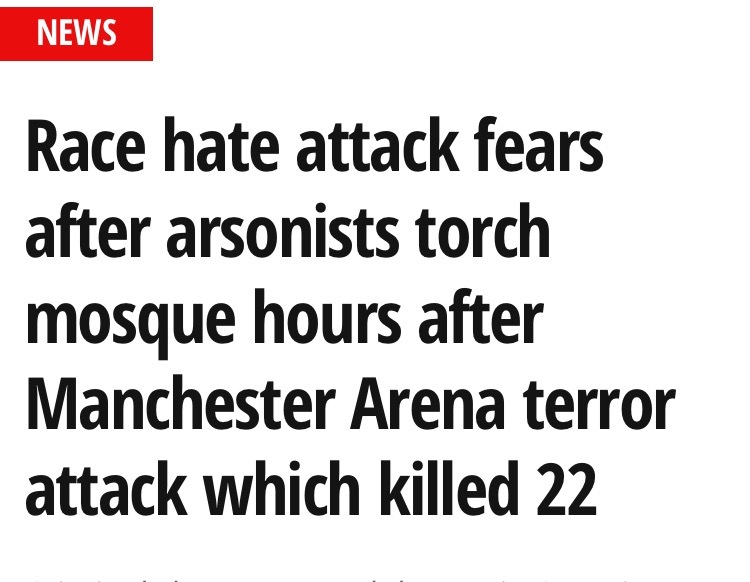 Shame on The Sun who took the opportunity to bludgeon Corbyn as supporter of terrorism. They put this editorial online after the attack, at 2:50am. An update then took place at 9:50am, after election campaign was suspended. They ran it for the whole day, to the disgust of many. Along with The Sun, some even said that voting Corbyn was an endorsement of the attack. Apart from the fact this is generally outrageous, we have no idea what the political views of the deceased and their friends and family are. For all we know, their deaths could be being used to push an agenda they don’t agree with. A risk Tim Dawson was willing to take. The theme continued in other papers. The far-right use such attacks as recruitment tools. As they do, they aid the likes of ISIS, who want to generate friction and conflict against the Muslim community in Europe. 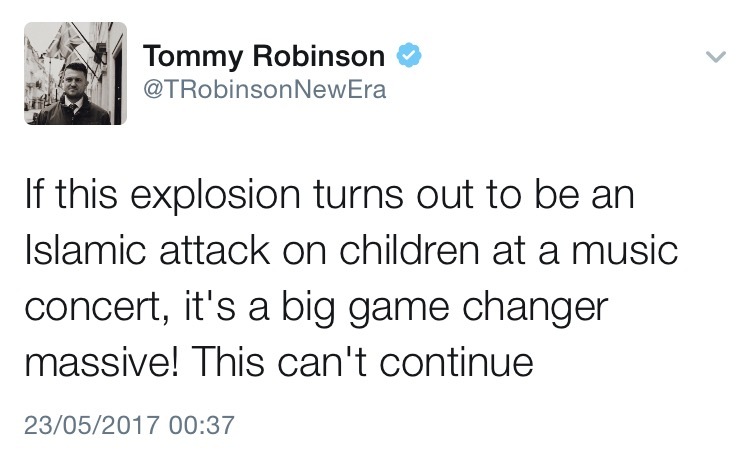 This tweet from the infamous Tommy Robinson reads more like a sports commentary. And nothing is too low for the fascists. 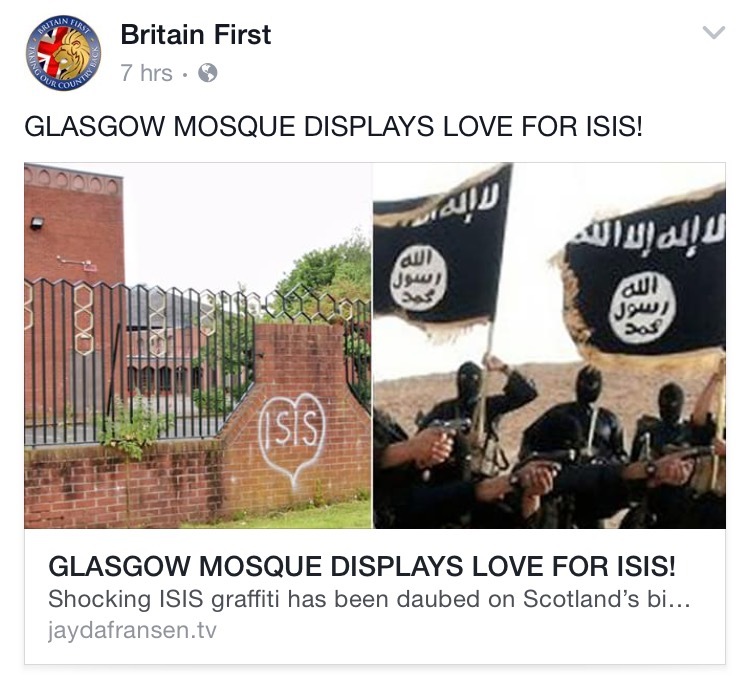 Did Glasgow Central Mosque, a well loved part of the Glasgow furniture who opened their doors during the Clutha disaster, paint their love for ISIS on their wall as Britain First claim? Or is it more likely that a Britain First follower painted it. Attacking the left seemed to be a common theme. 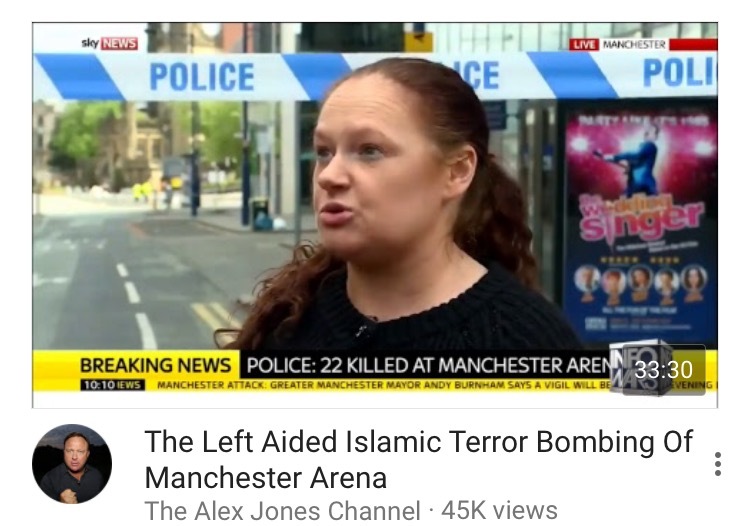 Right-wing conspiracy theorists claimed the left ‘aided’ the attack. And it seems the conspiracy theorists and the fascists like to hang out. The fact that one made his name from claiming that 9/11 was the work of a faction of the U.S. Government doesn’t seem to disrupt the narrative. 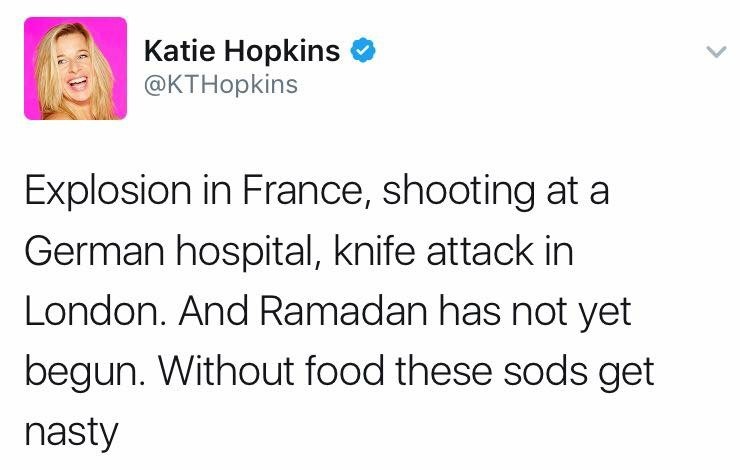 We must also reflect, not only at Katie Hopkins as an individual, but on what she means for the development of our society as a whole. How has she become part of its mainstream discourse? 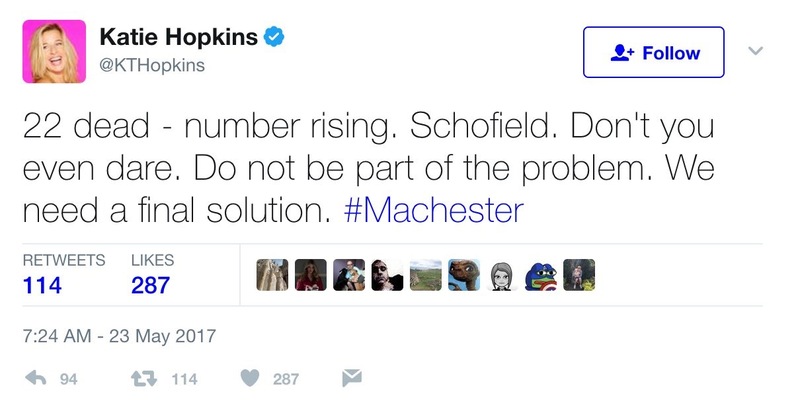 She who called for a ‘final solution’. The genocidal extermination of Muslims. At 7:24am on the morning after the attack. It took a lot to top this, but she managed. 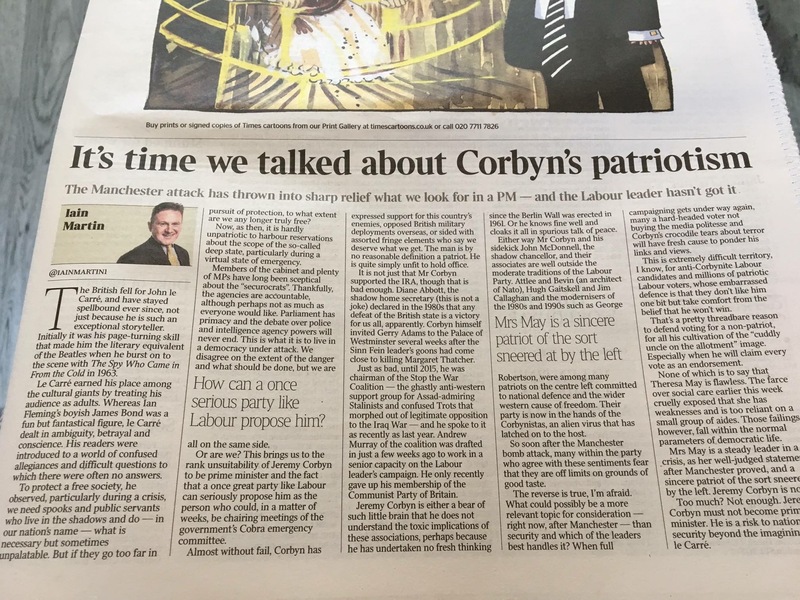 A lot of ignorance was on show, buoyed by having a social context provided for by the likes of Hopkins and the approach of the media and the state as part of a process of demonising Muslims. This illustrates how far we have to go. Thankfully, the vast majority of people are not this way inclined. But we can and must do better at countering this on social media, where much of it springs from. Why? Because words really do matter. They provide the drive towards violence and the social context that makes it acceptable. 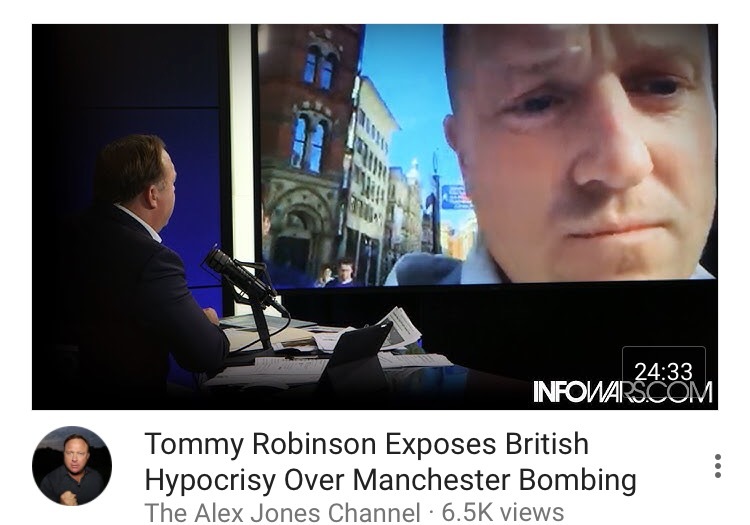 Once again, the far-right play directly into the hands of ISIS. 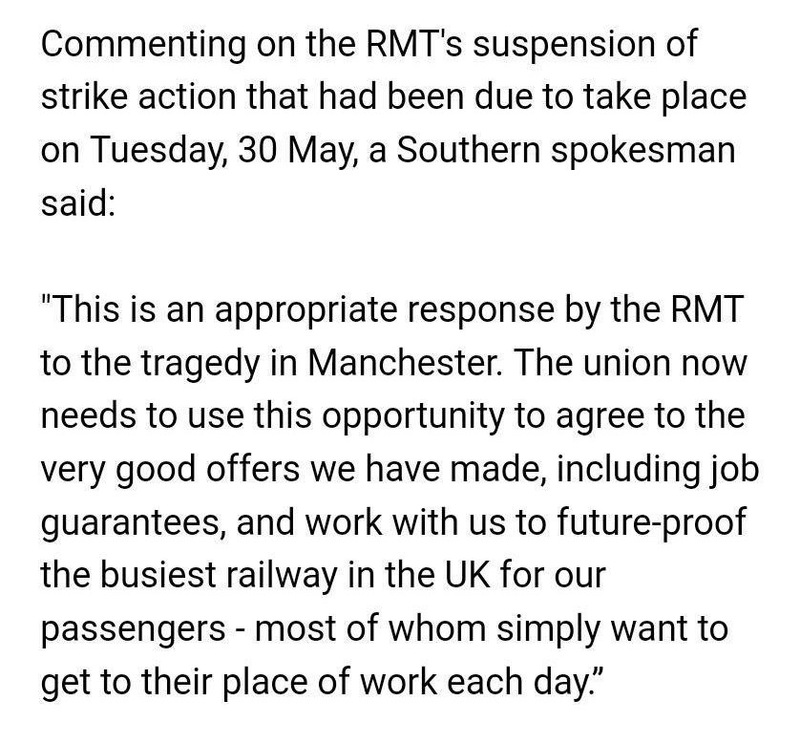 Aside from the far-right ghouls, we can’t not talk about Southern Rail who used it as a chance to cajole the RMT who called off strike action out of respect for the dead. All that was needed was to note the call off, instead they said it was an ‘opportunity’ to resolves the dispute on their terms. Then there are those who are make money from war and terror. Like G4S whose shares are surging or the billionaire weapons dealers. 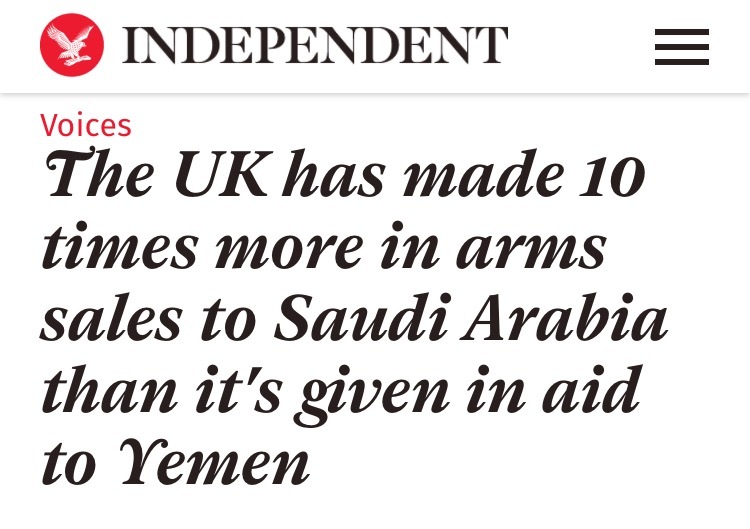 The big money deals with Saudi Arabia who we provide huge amounts of weaponry to. Conflict is big business. We need to confront the link between violence and profit as we go forward. 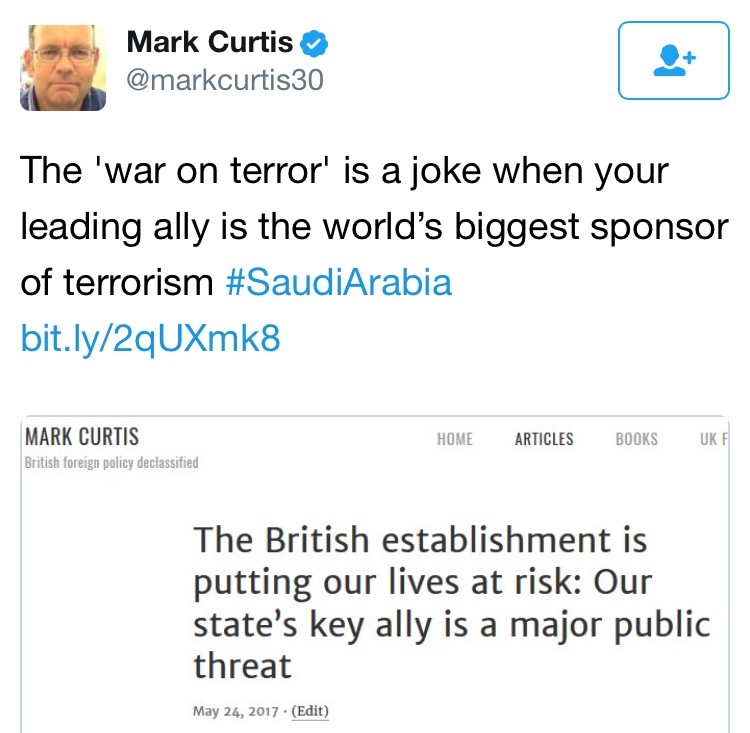 The irony is not lost on Mark Curtis. There are those that make Muslims across the UK feel the need to make an apology. For having done nothing. For having gone to work, for making their dinner, collecting their children from school, and yes for going to a pops concerts across the country. Because people like Piers Morgan demand it. 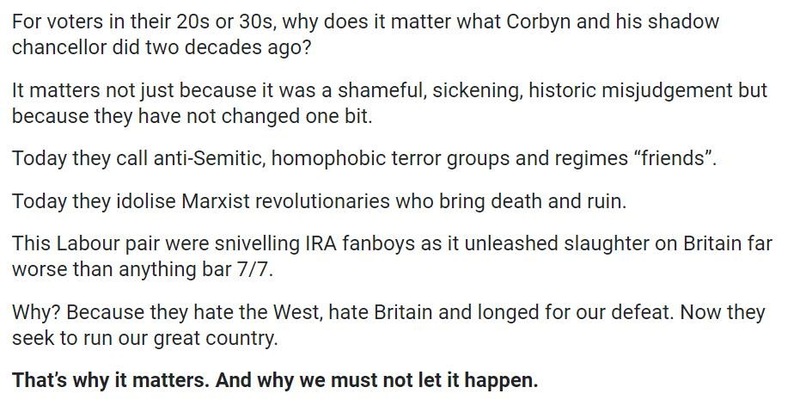 Because the state has deliberately built an architecture of demonisation to justify our leaders dropping bombs, for which they never apologise. 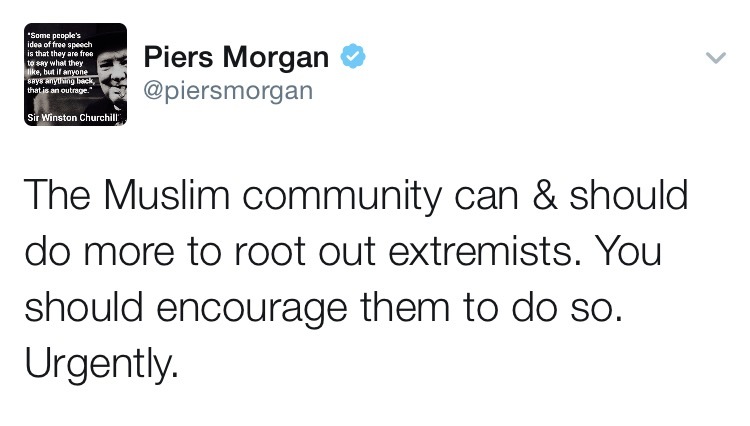 It might just be worth Piers scrutinising the security services rather than an entire religious group. 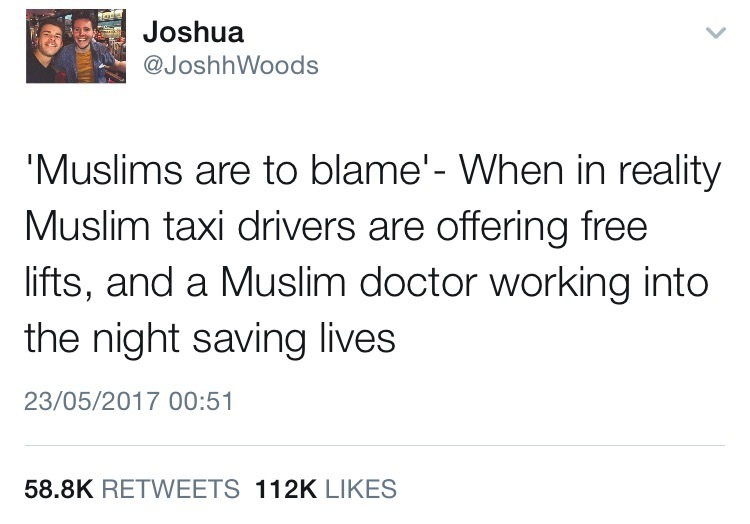 While this was all going on, Muslims were on the frontline. Helping the wounded, and transporting people to safety. Alongside all other faiths and backgrounds. Working together and in solidarity. And heroes were born. People who got on the ground to help. Not to make social media propaganda. The media coverage left much to be desired on two levels. One, the crass attempt to break news at the cost of causing further upset to those affected. 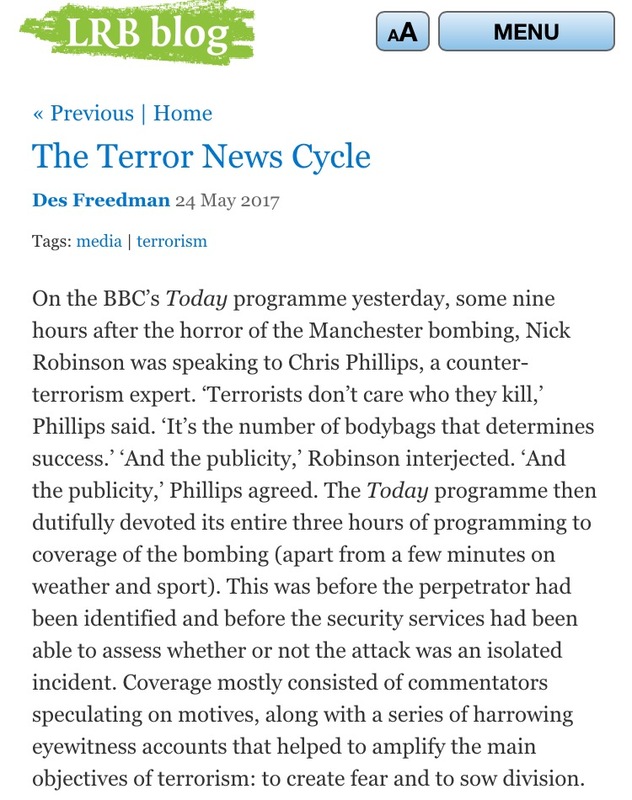 And two, because some media outlets actually facilitate the aims of the terrorists as they aim to create fear and sow division. Des Freedman explains. We are told that the election campaign has stopped. And quite rightly it pauses as a mark of respect. 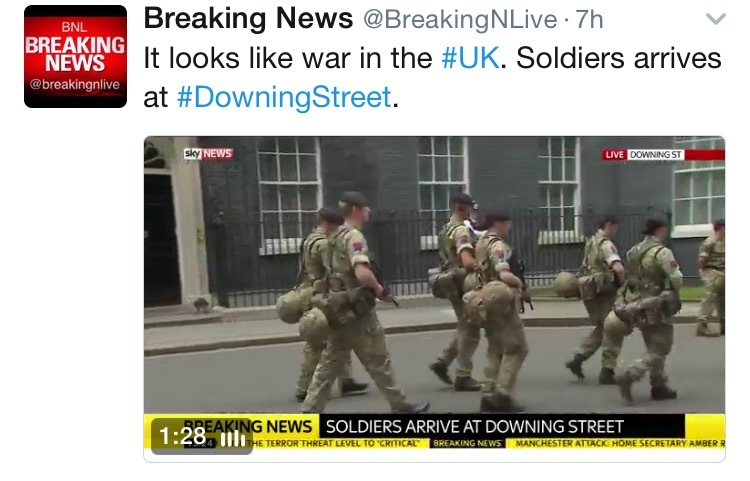 But during this time May launched her own ‘war on terror’, put the army on the streets and that all the while her stateswomenship is uncontested. This undoubtedly has an impact on the election itself. It’s also noticeable that May does not make a priority of saying these actions are in the name of defending democracy, especially as it is during election. It leaves many anxious about authoritarianism. As a result, activists speak out about the need to defend civil rights. This is something all democrats have to be aware of and democracy must be defended. It is important never to feel that the far-right fanatics and the establishment have the monopoly on morality when it comes to terrorism. Or that they are more concerned about it and have better solutions and that you should not raise your voice. A huge section of our society is waking up to the fact that they don’t. And that infact the last couple of days have shown just how depraved some people can be. But hope is a stubborn thing. And there is a lot of good in the world willing to stand up and be counted. 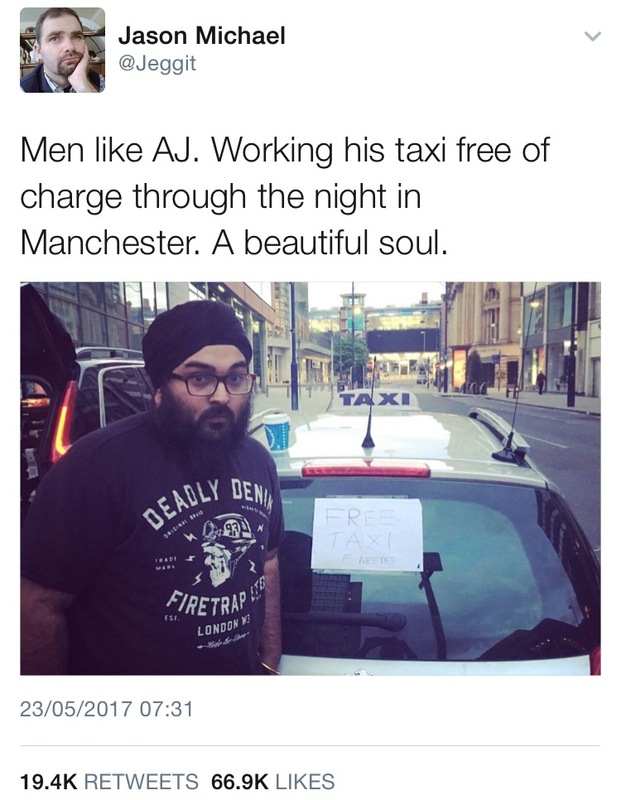 The best were on display in Manchester as they provided practical solidarity and refused to be divided…..by anyone. I actually avoided coverage once I had heard the headlines. The British media is always hysterical and speculative. Channel 4 news was good. Usually France 24 English and Al Jazeera Enflish tell you fairly unbiased ly what is actually going on in the world and you learn much more,than from UK stations and newspapers. But no, they were also wallowing in coueuristic and superfluous hysteria generating coverage. I cannot believe that for the first time I agreed with Donald Trump who,said the only sensible thing “They [the terrorists] are losers” quite so. Isis are also Gadaffis former Special Branch, unleashed by Tony Blair’s illegal war. Blame him. 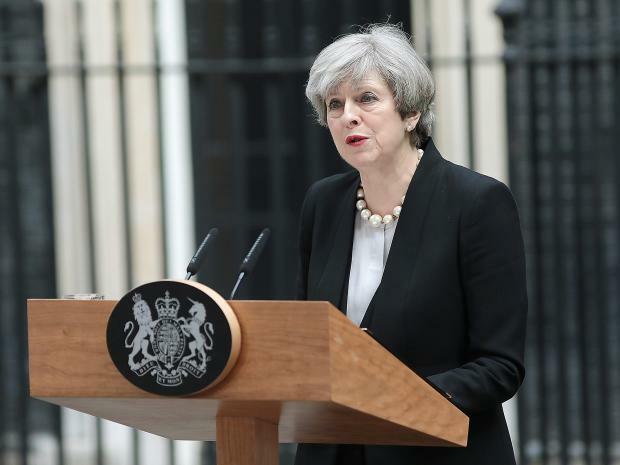 Armed police on the streets is completely wrong, will please the terrorists and get May nearer the armed dictatorship she would love IMO. I also avoided the immediate coverage, for much the same reasons, @Mabel. 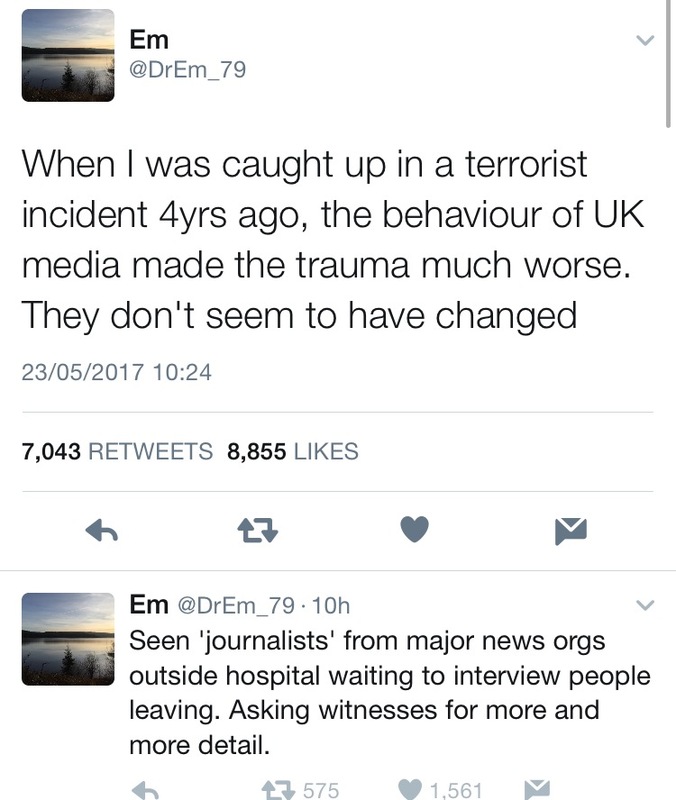 Investigation takes time, and any mass hysteria/overblown publicity/wild speculation leading to blaming sections of society/stoppage of democracy/knee-jerk reactions/demands for policy changes/troops on the streets/authoritarian power grabs/pundit hate speech… all these are ‘wins’ for terrorism. After determining that an explosion was a targeted attack, treat it as a serious crime and medical emergency and let the police and other emergency services handle it, calling on information from the public as appropriate. And you are quite correct that events should be seen in context and history is considered. The thoughts of academic philosopher Elaine Scarry in her book Thinking in an Emergency are relevant here. She proposes building social resistance to emergency threats with training, preparation designed to inculcate positive habits for fast and coherent action (rather than immobilisation or incoherent action). Scarry describes four models of emergency thinking: CPR (the widely-distributed emergency response by rigid steps learnt by rote which can save the lives of collapsed individuals); mutual aid contracts, which have been successfully used by communities in the events of storm floods and earthquakes in (for example) Canada and Japan; the Swiss shelter system to preserve inhabitants and culture against nuclear attack or other catastrophes; and the constitutional brake on war in the USA. The fourth model is different in that it is designed to impede rapid and injurious action, rather than speedily save lives and cultural valuables like the first three. However, she notes that since the rise of monarchical command and control systems which were introduced in the age of nuclear weapons, warmaking is now typically achieved by presidential decree (not just in the USA). Scarry proposes that by effective public deliberation on emergency procedures, we gain benefits in terms of community confidence, scrutiny of the effectiveness of policy, and the course of coherent action that should reduce injury and cultural degradation. I also watched Peter Watkins’ banned BBC documentary The War Game recently, and an accompanying programme revealing how the government of Harold Wilson secretly banned it. At the core was a government refusal to allow criticism of their wholly inadequate civil defence program that they wished to further cut, and probably uncomfortable comparisons with the Allied bombing of German civilians where many of the best practices in dealing with mass civilian casualties appeared to have been developed. 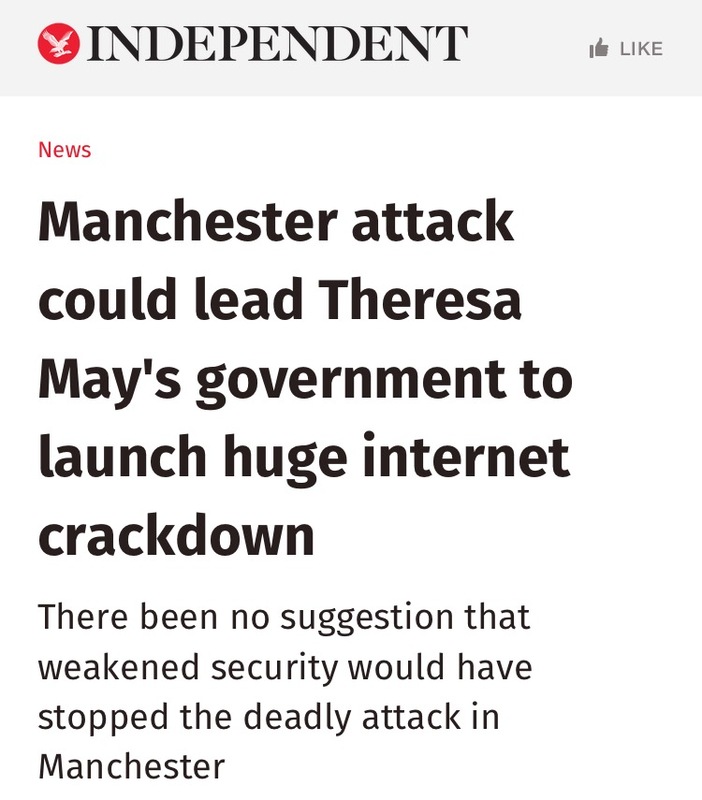 In other words, the current UK government may wish us not to think in such emergencies as terrorist bombings or anytime about the real effects of British foreign policy and militarism, or the curious case of Theresa May decrying targeting children with bombs with her finger on the trigger of a modern weapons system of mass murder targeting many millions of children with deliberate, horrible and inescapable nuclear death.